Your data is hosted in premier Tier IV data center facilities that are highly secure, fully redundant, and certified for SOC-2 and ISO 27001 compliance. Each site is staffed 24/7/365 with on-site security personnel to protect against unauthorized entry. Security cameras continuously monitor the entire facility—both indoors and outdoors. Biometric readers and two-factor or greater authentication mechanisms secure access to the building. Each facility is unmarked so as not to draw attention from the outside. Our IDC employs advanced network security elements, including firewalls and other boundary protection devices to monitor and control communications at internal and external network borders. These border security devices segregate customers and regulate the flow of communications between networks to prevent unauthorized access to IFC infrastructure and services. IFC supports a comprehensive set of data privacy and security capabilities to prevent unauthorized access and disclosure. Strong user authentication features tightly control access to stored data. Access control lists (ACLs) and administratively defined policies selectively grant read/ write and administrative permissions to users, groups of users, and roles. IFC encrypts data at rest and data in transit to prevent leakage and ensure privacy. All data stored on IFC is encrypted by default to protect data at rest. And all communications with IFC are transmitted using HTTPS to protect data in transit. IFC cloud storage is engineered for extreme data durability and integrity. IFC provides 99.9% object durability, protecting data against hardware failures and media errors. In addition, IFC supports an 90-Day data immutability capability that protects data against administrative mishaps or malicious attacks. An immutable object cannot be deleted or modified by anyone—including IFC. IFC data immutability protects against the most common causes of data loss and tampering including accidental file deletions, viruses and ransomware by protecting it from deletion for 90-Days. You need an infrastructure that can stand strong against even the most powerful brute force attacks. That’s why we provide you with brute force protection that logs invalid login attempts and slows down multiple attempts from a single user, making it virtually impossible for somebody to guess a password from one or more users. Your data is critical and we are understand it. The safety and security of the cloud storage service and the protection of your data is our primary concern. 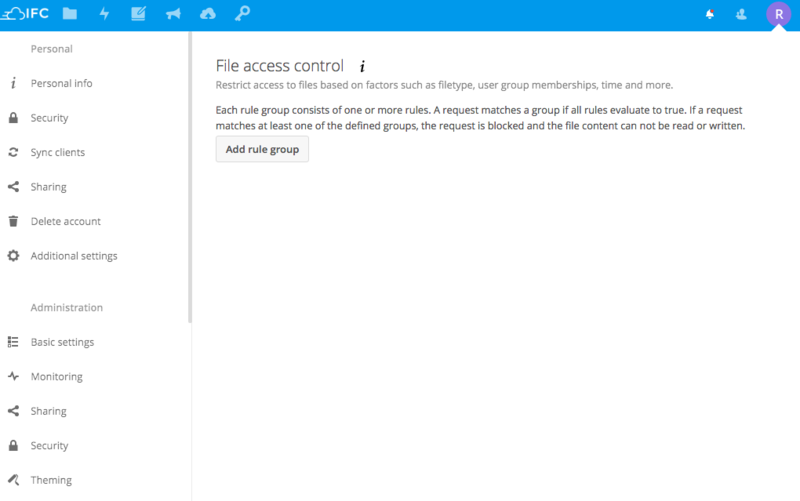 The Nextcloud authentication system supports pluggable authentication including Two-factor authentication and device specific passwords, complete with a list of connected browsers and devices on the users’ personal page. As extra protection, device specific password tokens can be denied access to the file system. Included are Universal 2nd Factor (U2F) and Time-based One-Time Password (TOTP) second factor apps, enabling users to use tools like Yubikeys or Google Authenticator to secure their accounts. Admins can enable or disable Two-factor authentication for users on the command line. Active user sessions can be invalidated through a list, by removing the user in the admin settings or by changing passwords. Users can manage their own sessions and devices. Nextcloud detects issues with its installation and warns when it finds unknown or modified files. Administrators can find security tips and warnings in the configuration screen. 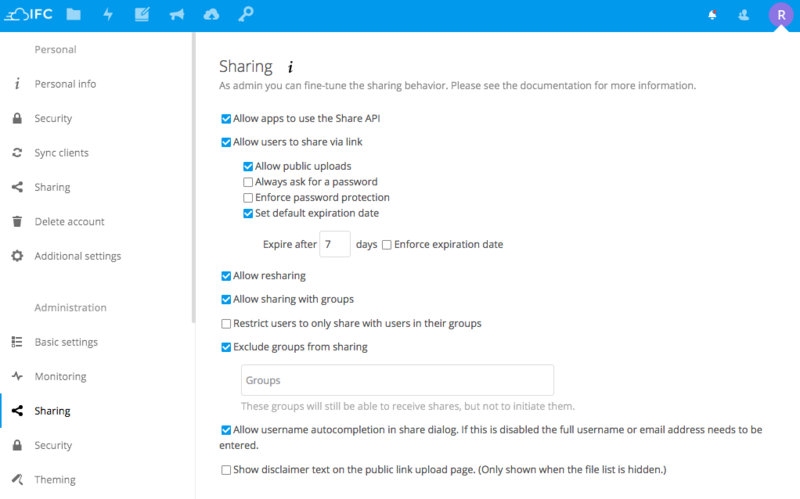 Administrators can set password quality policies enforced by Nextcloud as well as limit or disable sharing, enforce expiration dates and passwords on shares, disable preview generation and more. 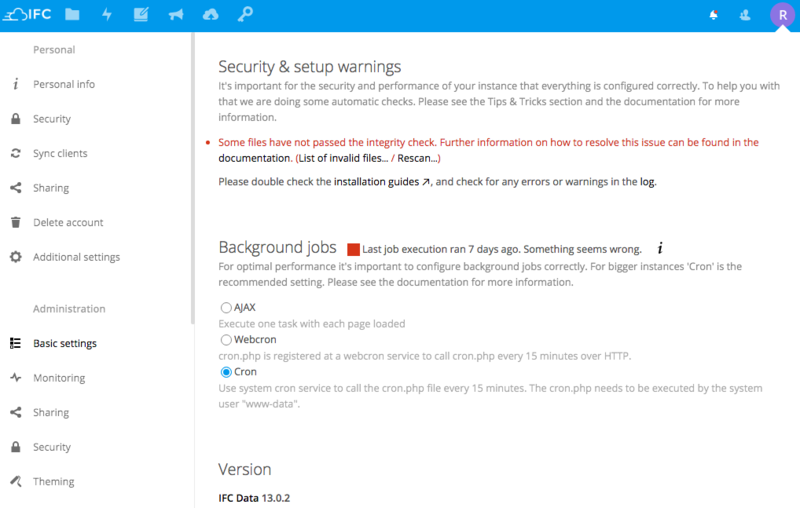 You can find more information on hardening your Nextcloud installation in our extensive hardening guide We provide the Nextcloud Security Scanner to check the security of your private cloud server. We provide cloud based enterprise hosting, server and storage solutions of unmatched quality in an exceptional environment. Based on the best practices from hundreds of successful engagements, IFCData brings together the best technology, practices and learnings for enterprise-wide cloud adoption. Your own cloud so you can deliver business results faster, no matter where you are. Bring your team together on to the Cloud, ensuring your team is aligned around your goals and objectives.Customers around the world rely on our products and infrastructure every day, making us one of the fastest growing companies in the industry. Signup for your Cloud and migrate file storage online, 99% availability, Security and controls implementation, . Set up processes and teams. Offload the maintenance and operations of your cloud environment, enabling your team to focus on what they do best.